Hiya guys! Mainstream Monday has been a segment I have wanted to start on this blog for a really long time. In true polish addict fashion, I spend a ludicrous amount of time (and money cause let's be real I have no resistance) at Sally's Beauty Supply and Ulta. That's not the issue though. The problem lies in the fact that I never have time to swatch or post about my little hauls and collections I purchase. The once little stack of untried polishes has grown to a mountain at this point! So for the rest of this season, every Monday I'll be mixing it up between press samples and my own purchases in the mainstream market. 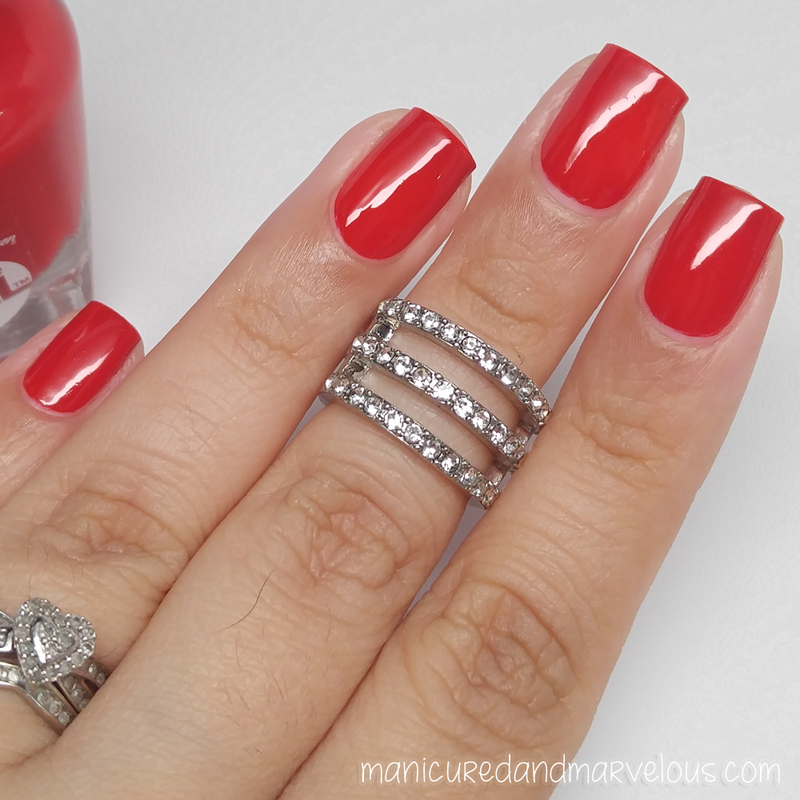 For today, I will sharing two polishes from Sally Hansen's Miracle Gel line that was released for the holidays. Sally Hansen's Miracle Gel polishes retail for $9.99 each and can be purchased at your local drugstore such as Walgreens and CVS. In addition to the shades, there is also a Miracle Gel topcoat that you could use to have an even longer wear time with these polishes. Rhapsody Red can be described as a cherry red creme. The consistency of the formula is on the thick side and initially applies with a few patches. However, the patches end up self-leveling out as the polish dries so there is no need for another coat. The polish is also extremely opaque as well and can really be left as is with just one coat. Shown here is one coat topped off with a glossy topcoat. Game Of Chromes can be described as a metallic gold . The formula on this one has a much smoother and thinner consistency than the previous red. I was surprised by the minimal brush strokes that are visible in the finish and it is quite possibly my favorite metallic gold to date for that reason alone! Definitely recommend picking this one up if you have been on the fence about metallic polish before. Shown here is two coats sealed with a glossy topcoat. Overall I have to say I am much more impressed with the Miracle Gel line than I thought I would be. I'm not one for gel polish so I thought these would be more hassle than anything else, especially when it came to removal. I was definitely dead wrong in that though. Removal was super easy, I just used non-acetone as I always do and they came off just like normal polish would. 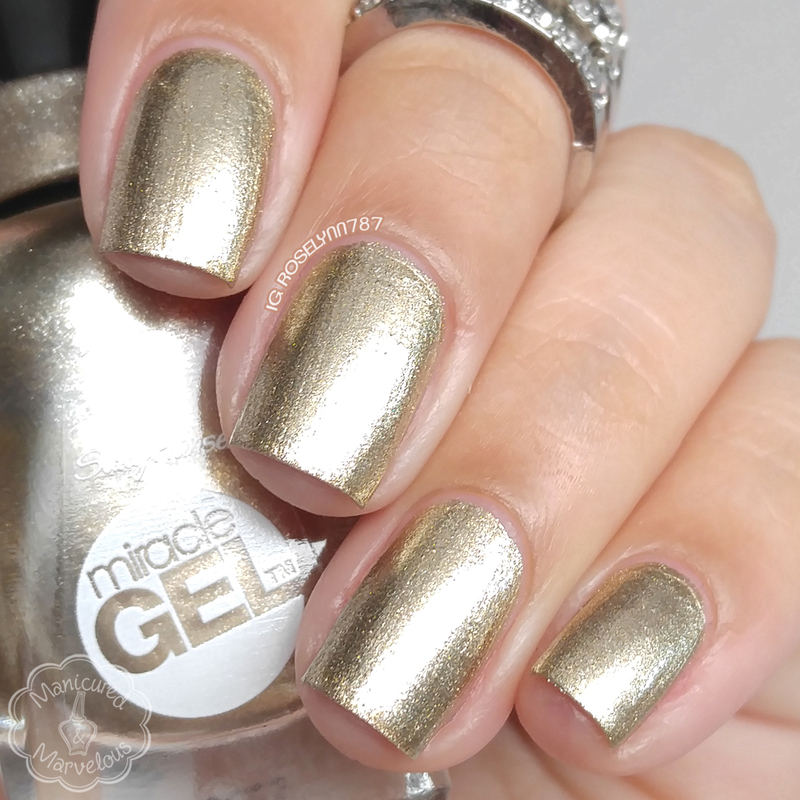 All that said though, I don't think the Miracle Gel line is meant for me only because I remove my polish so frequently. However if you're someone who is looking for at least two weeks worth of good wear time then I definitely recommend checking these out for yourself. As I mentioned before, Sally Hansen's Miracle Gel polishes retail for $9.99 each and can be purchased at your local drugstore such as Walgreens and CVS. This line has been out for quite a while now so the color selection is pretty large as well. I have been loving how much the formula have improved. From the first time I tried these about a year ago until now, they are soooo much better. I am also super in love with Game of Chromes. Well, this is something worth checking out. I am eyeing on that Rhapsody Red. I like the color and finish. Oh my - that red is really lovely looking! Huh, color me impressed- maybe I need to take a really look at this line of polish. And that red is capital C CLASSIC. I love that gold. It might not be an every day gold but it's perfect for the holidays. I really love Rhapsody Red! That red shade is so juicy looking! I love both shades, it's a combo I always reach for during the festive season! red looks lovely on you.